Hot Shot spends most of his time trying to prove himself worthy of being called warrior by the older Autobots. Unfortunately, this often means either showing off, which bugs the more experienced soldiers, or rushing headlong into danger, which requires a rescue. He's a got a lot of potential, but he's also got a lot to learn. Prelude: Hot Shot is a repaint of the Deluxe Bumblebee figure from Prime’s RID imprint. Since I don’t own that one (and don’t plan on owning it in the future, either), Hot Shot will be my only review of this mold. Some comparison with the other Deluxe Bumblebee mold of the line, First Edition Bumblebee, will no doubt occur, though. Robot Mode: Let's start with the head, which is completely new unlike the rest of the body. 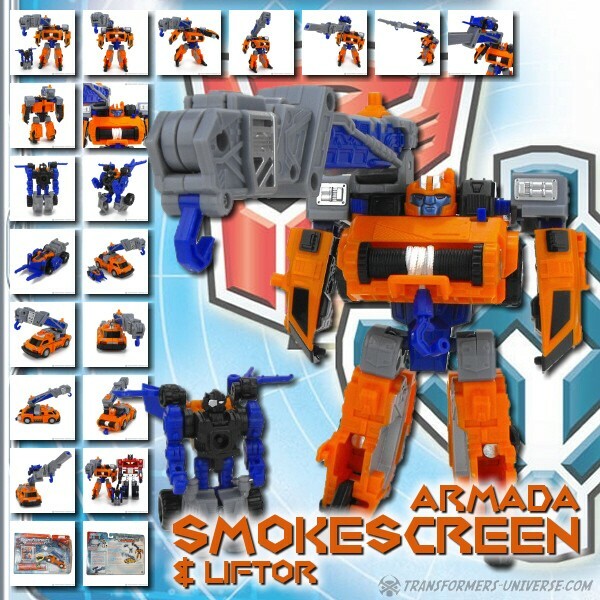 While the color scheme references Hot Shot's Cybertron incarnation, the head is a clear homage to the noggin' of the Armada figure, including the big visor it can pull down over its eyes. While it doesn't look as goofy as the original, it's still clearly meant to be Hot Shot. Nicely done. The rest of the figure is a pretty standard car-former, having the hood of the car as his chest with the rear of the car becoming the lower body. Nothing that extraordinary here. The differences to the First Edition BB mold are miniscule at best. The plate sticking up behind the head is new, the wing doors are configured a tad different, but it's all just minor detail. Articulation is pretty decent and the one major difference to the First Edition mold is the shoulders, which are somewhat more stable here and make the figure appear less broad in the upper body. An improvement in my book. Unlike the First Edition mold Hot Shot actually comes with two double-barreled guns, one for each arm. The two weapons can be stacked on top of one another, too, to give him a bigger gun on just one arm. So bottom line, a very nice robot mode and I really like the mostly blue paint job and the head mold. Thumbs up. Alternate Mode: Hot Shot transforms into an Urbana 500 sports car (or so I'm told, I never heard of that car before). The dark blue coloring plus the red and yellow flame deco actually reminds me more of Tracks than any previous Hot Shot or Bumblebee, but that's fine. It looks really cool and there aren't any visible robot parts to complain about, either. The weapons can be put on top of the engine block to give the car firepower. Not much else to say here. Everything fits together well, no drag on the underside, everything's fine. A nice car mode with no flaws. Remarks: Ever since the days of the first Transformers live-action movie it has become standard for any Transformers toy line to not only feature many, many Bumblebees, but also to repaint every Bumblebee mold at least once, oftentimes more. Thankfully in some cases the repaints are not merely “special” Bumblebees (Stealth BB, Nitro BB, Cyberfire BB, Cannon BB, Shadow Strike BB, etc.) but get to be other characters. Such is the case here, as we revisit the character who basically was Bumblebee during the Unicron Trilogy, Hot Shot. Hot Shot will probably not appear in the actual Prime TV series, but still: I’ll take a Hot Shot over yet another Bumblebee any day of the week. Overall the only really bad thing one can say about this figure is that it used to be a Bumblebee. It’s not a super-spectacular figure and I still don’t understand why they saw the need for two different Bumblebee Deluxe molds that don’t really look that different at all, but overall it’s a solid car-former and has no flaws worth mentioning. And seeing as it’s not BB but Hot Shot, I don’t feel bad about getting him at all. Word to the wise, though: if you do want a Bumblebee and have yet to decide between the RID or First Edition mold, I actually do recommend the RID one. The differences are minor, but I find the RID one a tad better and it certainly comes cheaper, too.